The spring 2009 saw the fabulous debut of Fendi’s new handbag collection. Unlike the innovative renditions of Baguette last season, the latest released Fendi bags are totally new in both design and material. Satchels and clutches maintained the hit products in the spring show and brought overwhelming surprise. With subtle femininity and delicate details, the peek-a-boo clutch comes in woven leather with structured shape. Sfilata Divided Satchel is another stunning attraction baring resemblance to a Birkin bag. Style.com called it the “kangaroo pouch” while WWD called it the” undone Birkin”. But apparently, the satchel is unique for the divided compartment design which gives plenty of functionality working as a day bag and work bag as well. You cannot feel amazed enough at Fendi handbags, because they continuously appear in fresh, modern and fantastic models. Signature bags were redesigned and brand-new styles have been created. Baguette, Spy and B bag respectively cover various versions. Take Baguette for instance, there is clutch style Baguette made of woven leather, extra large Baguette tote with striped Zebra print and leather fringes, and Giant Baguette clutch in multi color patchwork. The Fendi embroidered Baguette is a cute and coveted little purse for spring. It features black satin with multicolor Zucca embroidery. With a medium top handle and a flap top with Zucca cutout clasp, there is a gold tone Fendi logo plate at front. This captivating purse can work as an evening clutch with short handle or a perfect day bag. Fendi Sfilata Divided Satchel has been the hot item since its debut. Ladies are itching to get their hands on this luxuriously chic bag with super functionality. It is made of crinkled patent leather and features a structured square shape with two divided compartments. Down the middle of the interior, there is a fairly rigid divider. Each compartment has chunky gold tone turnlock closures. There is inside zip pocket for organizing your small essentials. Since the dimension of the bag is 16*13*5 inches, it can hold your 13-inch laptop and it even has small deep pockets for laptop accessories. Of course you can stuff it with your daily necessities and small pieces including cell phone, keys, cosmetic mirror etc. The price is economical compared with the great functionality and versatility, as you know it serves as both day bag and work bag. Sfilata Divided Satchel is a good investment because it offers stylish look and practical using at the same time, moreover, the sumptuous and pliable leather ensures a long time use. Buy gorgeous Fendi handbag at www.stylishpick.com and www.eurohandbag.com, and you will get much satisfaction and convenience. 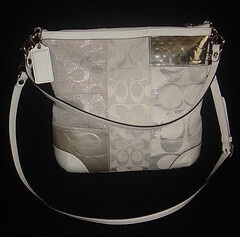 for information relating to designer handbags.